'The Dying Grass' is a beautiful and important book on a variety of levels. Vollman's visions of the people, of the landscape, of the movements of men and history are detailed and extravagant. The book itself is a thing of beauty, and smart readers will want to pick one up now as opposed to later. It's expensive and worth every penny. Viking should be rewarded for this investment in literary art. You won't just find a lot of pages. It's clear that the author and publisher have lavished attention on the appearance of every page, and for the reader, it pays off. Once you get the hang of reading Vollman's prose, this is a quick read. It's a long immersive process with an appropriately high reward. What Vollman does with all these indents and his poetic turns is to convey the complexity of many minds looking at the same events from a variety of perspectives. He weaves conscious, unconscious, spoken and unspoken thought with what becomes a startling level of clarity and readability. Readers will have access to carefully created historical figures at a level of detail that one might well imagine to be impossible. Vollman achieves a literary mind-meld. The story of course is tragic and violent. The short version is familiar; we promised the Nez Perce tribe land, decided we wanted it and made them move until they decided to fight. Vollman crafts his characters with care, joy, humor and honesty. Nobody's pure. But, by virtue of Vollman's multi-leveled conscious-exploring prose style, where we experience the simultaneity of these men's and women's thoughts, we let's us become them. This be beyond identifying with characters; we become them, we ride their minds like a powerless voodoo loa taking possession, given access to the mind but unable to control it. We're helpless in the face of history. History is pretty ugly, even when the writer who renders it does so with an eye towards literary beauty. 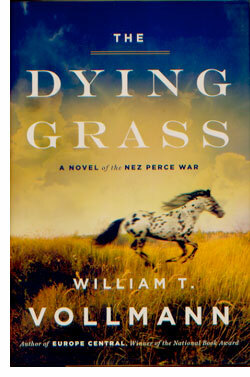 'The Dying Grass' is a long book. It might help to think of it as a series bundled into one volume. It won't take as long to read as you think. Moreover, you won't think of yourself or your world in the manner after you read the book. You'll be keenly aware of your own simultaneous experience of life. You'll feel yourself in the currents of history, aware of your part and your past and your present. 'The Dying Grass' will require some work. It will rewire your mind. We cannot change the horrible past. But we are riding a wave into a future that we are creating in every moment of our lives. We can change the future. First, we must change ourselves.